Grant Langston may have had to leave his Alabama home and ultimately head west to pursue his dream of making music for a living but from the evidence of his new album WORKING UNTIL I DIE, he is a shining example that good quality country music is being made outside of Nashville. The lack of big label backing deems the existence of such an artist a constant struggle but with the input from pre-buy backers such as those Langston listed on the cover sleeve, it is a credit to all parties involved that we can savour the fruition of this talented performer. For this, his 5th studio album, Langston has enlisted the services of producer Paul Q. Kolderie and retreated into a Los Angeles studio to record a collection of songs that represent a diverse cross section of country sounds. With a core band of four musicians supplying a multitude of guitar, banjo, keyboard and percussion input supplemented by session players adding the fiddle and pedal steel, all the essential ingredients of a country record are in place, with the song writing skills, melodies and lyrical content of Langston adding the finishing touches. The resultant product of this creative mixture immerses you into a 45 minute whirlpool of straight down the middle, pure and honest country music which a few of the more commercial acts could do no harm in engaging with. The opening track of the twelve on offer ‘I Fall For It Every Time’ is a good ole honky tonk number that perfectly sets the tone of what you can expect from the rest of the album and there is a neat interchange of styles and pace that ensures the listening experience remains fresh throughout its duration. The second track ‘Trouble Knows’ has unsurprisingly been earmarked as a song for further promotion, hence the production of a video to support this pop-influenced song that has the potential to reach out beyond the country genre. The perfect example of how effective the track order is on this record is in the sandwiching of the slow burning ‘Sweet Little Girl’ between the hoedown inspired title track ‘Working Until I Die’ and the hurtling along number ‘Along For A Ride’, both heavily fiddle influenced. The continual experimentation in country sounds is found in the rocking vibes generated from one of the album’s standout tracks ‘Try Me’, an infectious song that inspires many repeat plays. In complete contrast but equally as appealing, the waltz-like rousing anthem ‘Everyone Loves Me When I Am Drunk’ shows an alternative side to Langston song direction containing lyrics with sad undertones. This serious side of Langston’s song writing has come to the fore more on this record than his previous releases and he has acknowledged the effect of the economic meltdown in contributing to this change of direction. In an album of evolving quality, Langston has captured the perfect moment of peaking at its climax with a wonderful account of putting western pretences in context with a stunning closing track titled ‘Ain’t That Kind Of Cowboy’. This track is pure country gold, dripping in the luxury tone of pedal steel and even allows a little trumpet interlude that in no way dilutes the country sound. Few could argue with the line embracing Merle Haggard ‘as a kind of teacher he wished he had back in school’ and a perfect way to close this highly recommended album. 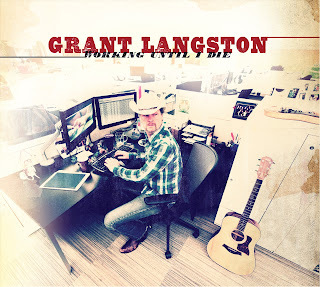 Don’t just take my word, buy the CD, download the tracks and spread the word of Grant Langston.